Enter your zip code to view participating stores near you. We have partnered with thousands of pizza stores nationwide so you don't have to contact them! * If you wish to signup your own store, choose our local favorites card. 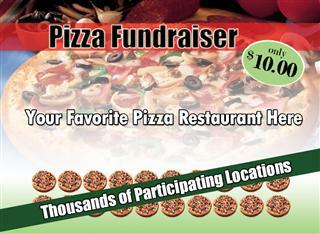 Order your pizza fundraising cards. We recommend 5 fundraising cards per fundraising participant. If a group of 40 sells 5 cards each, your total profit will be $1,900! In a rush? No problem - UPS next day & 2nd day available! 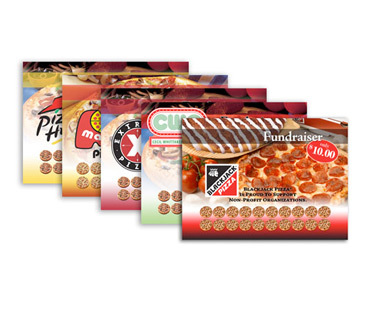 Sell your pizza fundraising cards for $10 each. Each pizza fundraising card contains 20 punch-outs; supporters get over $200 of free pizza for a $10 donation, making this card an easy sell. Read Tips on selling the cards and making your fundraiser a success. Reorder more cards as necessary! Quick delivery within one week. Businesses like them because they bring in more customers. Supporters like them because they save money on yummy pizza. Fundraising groups like them because they are easy to sell. Each card is sold for $10 and contains 20 punch-outs. Each card is valid for at least one year. Is this card only valid at only one locations or all locations? The cards are store and address specific. We can use up to 3 addresses for the same brand on one card. Download the merchant agreement form and approach pizzerias in your local area by asking them to support your fundraiser. If they are willing to support your fundraiser, have them fill out and sign the merchant agreement form. Order a local discount card. We will design and print your card for you! Orders less than 500 cards take about one week, 500 cards or more will take about two weeks. How long will it take for me to receive my cards? Once your order has been processed, it will take 3 – 6 business days for you to receive your cards. Is there a minimum number of cards I need to buy? There is a 100 card minimum order. The cards will have your organization name printed on the front of the card.